Thank you for the awesome comments and questions on my photos. Kind of a pudgy lillte fella. This is so funny! Great capture! a stunning shot of this sweet chubby fella fast asleep, he sure found the right branch! fav! Awww, he’s a little chubby now! But that doesn’t look like a comfortable place to nap. Gobsmacked for sure! Ha,ha...Such a cute, fun capture...Krissy has a smile :). It certainly doesn't look a comfortable position. Lovely shot. 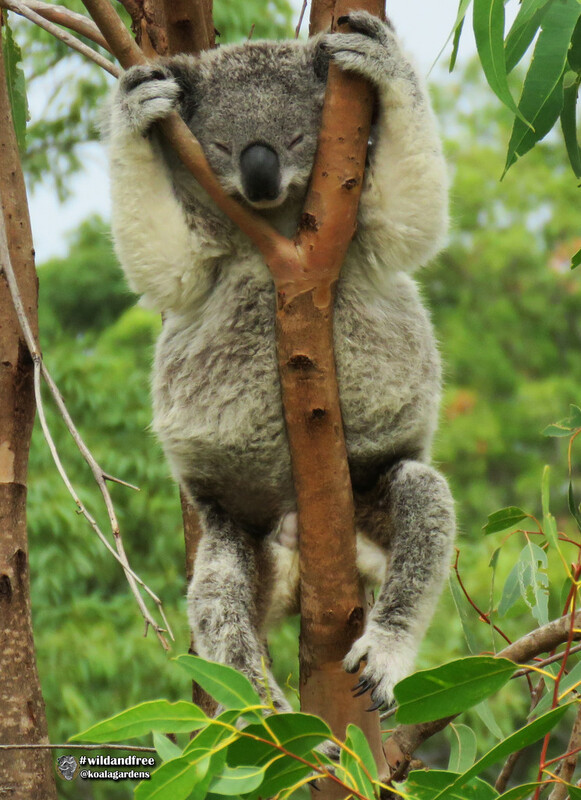 @koalagardens A question, though- how do young koalas gain weight as they grow? I know from you that they consume mostly leaves, and expend their energy climbing and holding on to trees. They must eat a lot of greenery. This is an absolutely brilliant shot. It certainly made me smile. Absolutely priceless !! I wonder if he is on a stick !! Koala strong and stable class. bwahaha!!! this is awesome! He was sleeping? Just hanging out lol! :-) Made me smile. a funny pose and capture. How amazing to capture him in this position. These koalas must keep you constantly entertained! Oh my ...what an absolutely amazing image - from top to bottom! Guess it was sitting on a limb on the back side and not just hanging on as it appears from the front. that is a shocker of a position. Great capture. Haha this is too funny! This is so wonderful! Priceless! @kchuk yes indeed they eat a lot of leaves. At the size he is and with the way he is growing, he will be eating 350-400 grams per day. Might not sound like much, but that is a lot of leaves you need several leaves just to make up one gram (depending on which tree as some are larger leaves). @koalagardens I noticed that... ouch! This is too funny! And it reminds me of some of the unusual positions children fall asleep in too. Maybe he was trying to pull a wishbone apart...haha! @gardenfolk @kchuk thank you so much, I was totally not expecting that! 😂😂😂😂 this is priceless - I have never seen a koala hung like this...and that belly! Congratulations on TT - he still cracks me up when I see him like this! Such a fun cute capture, Congrats on TT!